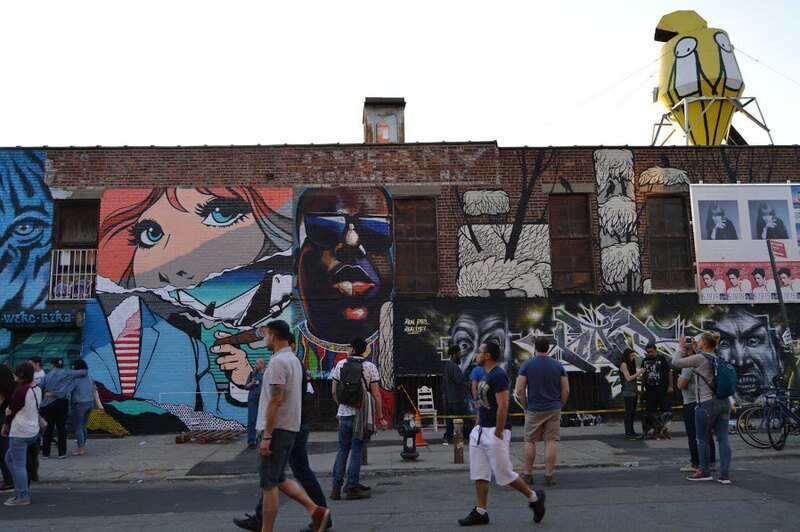 A street scene from a past Bushwick Open Studios event from the Bushwick Daily Archives. Local arts organization Arts in Bushwick held a much anticipated town hall meeting Wednesday night to discuss the decennial of popular annual Bushwick Open Studios, which will be held on the first weekend of October this year, announcing some programming changes and providing the public with opportunities to give input and find a way to get involved as volunteers in the BOS planning process. At activist center MayDay Space, which shares a home with the Bushwick Abbey and Iglesia Santa Cruz at 176 St. Nicholas Avenue, some of AiB's core volunteers took the stage to address the assembled crowd of artists and other interested community members to discuss the upcoming event. AiB founder Laura Braslow kicked off the meeting with an introduction to the group and its mission, emphasizing that while the recent changes at AiB have been characterized by some as a departure from the organization's previous institutions, the changes reflect commitments that the group has always had at its core. Nicole Brydson, another AiB volunteer, made a point of emphasizing that this year's changes are in part intended to keep Bushwick Open Studios from serving as a convenient way for real estate interests to capitalize on the neighborhood's cachet, making the observation that "real estate gets sold in the summer, art gets sold in the fall" and getting applause as she characterized the refocus of BOS to something that will "allow us to stay here." AiB's Cibele Vieira announced several projects the organization would be undertaking this year, including plans for an AiB book which will include the work of many artists who have participated in BOS over the years as well as an anthology of writings on displacement, gentrification and other issues Bushwick denizens face. The organization also has a zero waste goal this year, and will go paperless, focusing on developing a dynamic and mobile-friendly BOS website guide rather than printing thousands of catalogues listing participating artists. All of this year's events will have open call submissions, and the registration fee has been reduced from $35 to $25. Additionally, all of the organization's planning meetings, which will be open, will be announced to the public to facilitate involvement. Programming presentation is also being reevaluated to shift the tone of the event from a party atmosphere to one that benefits the neighborhood's residents and practicing artists. Changes related to this include plans to host seven or eight neighborhood hubs throughout Bushwick which will help attendees navigate the many participating studios which will features places to view the reactive digital maps, and a commitment to having bilingual English and Spanish event information, as well as initiatives to get foot traffic to farther flung, less accessible corners of the neighborhood. Outreach efforts this year will include a street team that will have the resources to literally knock on doors to make sure locals are aware of the event and its offerings. AiB volunteer and activist Anthony Rosado explained that the changes are intended to make BOS "way more inclusive of all of Bushwick." "We've come a long way, and we've been working hard," he said, describing AiB's efforts to rethink its approach. Most importantly, attendees were encouraged to come on board with the organization to help make the major event, which annually draws thousands, a success. AiB is all volunteer and non-hierarchical, so there's plenty of opportunity for volunteer work to have a major impact, though Braslow made sure to note that the organization vets all ideas and proposals in light of its mission. An artist named Elizabeth who asked whether artists displaced from the neighborhood would have an opportunity to be included in the event was encouraged to take on a planning role to help make such an opportunity a reality. Throughout the meeting, an emphasis was placed on on the importance of being a socially responsible organization. "We have....to do something more than make art in our studios," said Vieira, to which Braslow added that historically, such efforts on the part of the organization have often been overlooked by media and individuals who would prefer to characterize BOS as a trendy scene. "No matter how loud we talk about it, people want to see what they want to see," she explained. When asked by a reporter about the accessibility of the event, one AiB member responded that "accessibility is not enough. [BOS] has always been accessible."